Saturday is The Big Day, culminating almost two years of preparation. All but one of the boats leaving from Key West are here, and the last will arrive shortly. Jimmy Cornell is here, with his boat Aventura, and his wife and daughter and crew. We’ve had our first briefing, plus a social gathering. I look forward to getting to know the other crews better. So far I’m mostly trying to remember names and who’s on what boat. Two boats have just withdrawn. One due to health issues of the owner, one due to lack of funds. Both crews are here, and delightful people. Very disappointing that they won’t be voyaging with us. The size of our fleet is much smaller than originally planned. We will have 7 boats leaving from here, if we include Jimmy, who will be sailing on a different schedule, but meeting us in Tahiti. 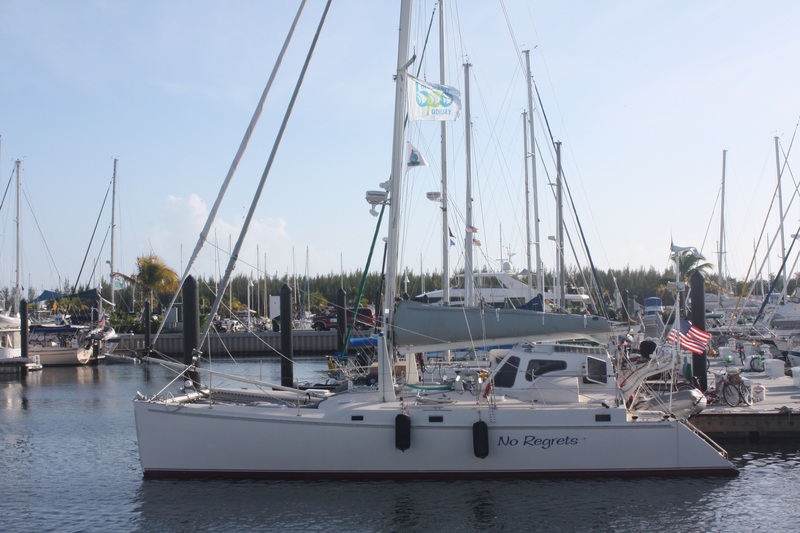 There will be 6 boats leaving from Martinique, and joining us in Panama. Two or three other boats are leaving from other points, and will join the fleet in the Pacific. Some think our engine rooms are cursed, and we are going to suffer ongoing problems. I prefer to think that, like getting my appendix out, we are doing some serious preparation, and things are going to be better for our efforts. It would be naive to think all the problems will suddenly stop, but I do think we are doing everything we can do now to improve the situation. Lots to do this week. Today we started finding places to stow some gear that has never had a proper home. That makes me happy — finding places for things. And, in fact, finding out exactly what things we have. We discovered that we have 6 inflatable life vests with safety harnesses, plus 2 more without harnesses, plus 4 additional harnesses (not inflatable). Of the twelve total, we gave 6 away to the boat next door. Better to have less stuff, and be clear about what it is and where it is… Much more to do along these lines. We’ve done an initial big shop for non-perishable food; we will of course have to do another toward the end of the week for perishables (though not much room left left in the galley to stow them). Another potential hurdle is our safety inspection to be done by Jimmy Cornell. I think we’ve done all the right things to pass this inspection, but a lot is open to interpretation, and Jimmy will be doing the interpreting. Here we are, with our Blue Planet Odyssey flag flying.